JTF (just the facts): A total of 3 large scale photographs, framed in white and unmatted, and hung against white walls in the single room gallery space. All of the works are c-prints, made in 2014. Each is sized 93×68 and is unique. Comments/Context: Travess Smalley’s new works bring enveloping full-body abstraction back into the vocabulary of cutting edge photography. At nearly eight feet tall, each print demands attention with authority, pulling the viewer into an all-over investigation of tiny surface details and textures, swathed in tones of gentle grey or rich black. They’re the kind of pictures to get lost in, to stand in front of and slowly scan from edge to edge in search of discoveries. For those of us who revel in the ever expanding definitions of photography and its often unlikely list of experimental processes, Smalley’s modeling clay on the glass surface of a flatbed scanner images fit right into the now customary step-by-step discussions of newfangled procedure. 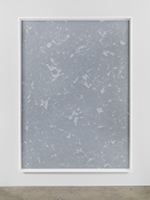 For this particular body of work, there is a resolutely physical interaction going on – Smalley pushes, pulls, kneads, and twists the clay, squishing it with his fingertips, rolling it over, and pressing it down until it smears and reforms, filling the available surface with smooth flatness and dented, pocked holes. Smalley’s whorled fingerprints decorate the clay, turning into exaggerated striations and lines that populate the surface. When the scanned compositions are then printed out at enormous scale, tiny cracks and flaws become monumental, and refracted light from the scanning process adds miniscule rainbow flares to curves and undulations. It’s like looking through a microscope and seeing an entirely new world of gestural textures. Smalley’s previous images from this series (Compositions in Clay) employed two or three colors of clay, mixed together into jumbled swirls of hybrid color. In these newest works, he has pared that visual energy back to a monochrome palette, opting for single color compositions in dove wing grey (with white highlights) and a deep black (with almost blue highlights). While the grey photograph resembles a concrete sidewalk and the black ones recall a skyward view of space, the colors seem to function more as mood setters, the grey image slightly warmer and more inviting, the black ones more imposing. In either case, the color is extremely subtle, allowing the viewer to dive into the mottled surfaces and textural nuances. While artists as diverse as Jenny Saville and Marilyn Minter have pushed against clear substrates to create unexpected visual distortions, Smalley’s abstractions in clay are much more restrained, and less about violent action. It’s almost as if he is taking a set of exaggerated painterly gestures and flattening them out, like putting a mute on a trumpet; we can still see the evidence of his hand, but it’s been quietly transformed and toned down by the unyielding surface of glass. To my eye, there is something refreshingly confident about letting your artistic expressions be consciously hushed and dampened; it says you’ve gotten over worrying about attracting attention and have moved on to more complex concerns. Collector’s POV: The works in this show are priced at $19000 each. Smalley’s work has yet to reach the secondary markets with any regularity, so gallery retail remains the best/only option for those collectors interested in following up.